THE Gillard government has announced four new board members to help run the $10 billion Clean Energy Finance Corporation (CEFC). The corporation, part of Labor's carbon price package, will support renewable energy projects through loans, guarantees and equity investments. Based in Sydney, it will invest funds from July 2013. The board members announced on Friday are recently retired Macquarie investment banker Michael Carapiet, fellow banker Ian Moore from Banker's Trust, former solicitor and Climate Works Australia executive director Anna Skarbek and ex-Origin Energy senior manager Andrew Stock. All have been appointed for five-year terms. They will work alongside corporation chairwoman Jillian Broadbent, who is also a Reserve Bank board member. "Today's board appointments will underpin a robust and rigorous organisation which will help ensure Australia remains competitive as we move towards a carbon-constrained global economy," Treasurer Wayne Swan said in a statement on Friday. Treasury has estimated the CEFC could lose 7.5 per cent of the capital it invests on unsuccessful projects but overall it will aim to make a profit of four per cent a year. Treasury, of course was out by 100% in last years budget deficit calculations! The UK has many ugly wind turbines dotted around the place. It's educational to look at the UK National Grid Status page at http://www.gridwatch.templar.co.uk/ which shows just how little all those wind turbines contribute to supplying the total grid load. The situation wouldn't be any better here even if Labor somehow got re-elected and had its way. Juliar Gillard, Wayne Goose and the rest of those ex-ACTU clowns are living in a fantasy which all us real Australians are supposed to pay for. The Gillard government will fall, but it has poisoned the well by the contracts it has signed, and the Australian people will have to pay the price -literally- for a very long time to come. It is shocking and shameful that a government can do this to the very people it claims to represent. Great idea. Their remuneration should start when they achieve the goals they have set by funding the unfundable to get profits from the unprofitable. If half of Larry Pickering's "Is The Prime Minister A Crook?" series on his website (http://pickeringpost.com/) is factually true and the mainstream media starts reporting it, we won't have to endure Gillard for more than another few weeks. Without Gillard, a tiny bit of sanity might return to Canberra. I am 68 years old and am not having babies at the moment ,nor do I have any immediate plans in that direction. 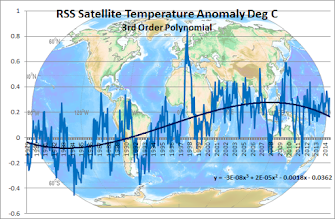 I have little regard for climate carpetbaggers especially those who have resurrected the Papal indulgences scam with selling carbon credits to the gullible to expunge "climate sins". 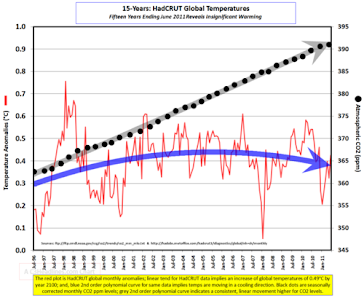 As to the global warming you say we should be protected against you should read the following satellite temperature graph (if you can) showing the rampant warming of the last 15 years. Finally with regard to euthanising much-loved pets at the direction of eco-crackpots maybe we should start closer to home with those who propose such barbarity!